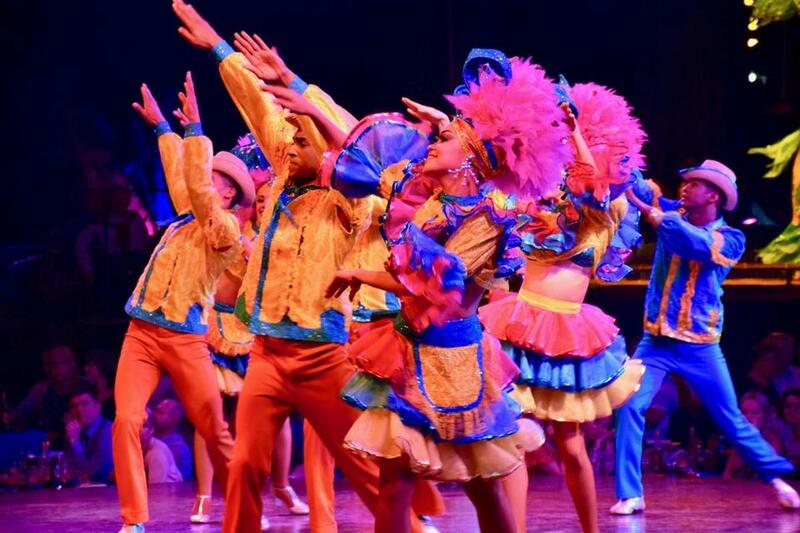 The famed Tropicana show continues to serve up the classic color of pre-Revolution Havana. HAVANA — About an hour into the best American movie of all time, “The Godfather Part II,” the action moves to Cuba. It’s December 1958, and we see mob boss Michael Corleone, played by Al Pacino, being driven through the streets of Havana in a light-green, wide-fin, ’50s-model Mercury sedan. We see him squinting into the Caribbean sun from a hotel rooftop lounge as he and a group of capos cut into a Cuba-shaped cake while divvying up ownership of the island’s casinos and resorts. And we see him taking in one of Havana’s famed over-the-top nightclub shows, where the lithe dancers wear false eyelashes that almost seem longer and fuller than their outfits. The Corleone saga is gripping but fictional. Yet just about everything else about these “Godfather II” scenes is authentic — the cars, the clubs, the mobsters’ rooftop huddle, even Batista bolting from his palace (now home to the Museo de la Revolution) on the last night of 1958. As we approach the 60th anniversary of the Cuban Revolution, which led the US government to turn the island nation 90 miles from our border into a permanent pariah state, what is remarkable is just how much of that swinging 1950s Cuba remains intact today. As it turns out, there’s still plenty of ice left in the box. President Trump, as he did with so many other Obama initiatives, reversed course on Caribbean glasnost. The result is that it is once again cumbersome, though hardly impossible, for American tourists to travel to Cuba. In fact, in November JetBlue started a new direct flight from Boston to Havana. The American tourism numbers that surged at the end of the Obama administration have settled way down. As disappointing as this retrenchment may be for many hopeful Americans and Cubans, the silver lining is it’s been an effective inhibitor of the Fort Lauderdale effect. In addition to marking the 60th anniversary of the revolution, Cubans will be celebrating the 500th anniversary of Havana’s founding in 2019. Although there is once again uncertainty in the US-Cuba relationship, it also happens to be a great time to see vintage Havana on display, especially if you’re a “Godfather” fan. A street scene in the capital of Pinar del Rio province. The casinos are long gone — Fidel Castro viewed them as an emblem of the worst impulses of capitalism. But the hotels that housed them are still around and, for better or worse, remain largely unchanged. When Meyer Lansky, the real-life mobster who inspired the Hyman Roth character in “Godfather II,” opened the Hotel Habana Riviera on the Malecon seafront promenade in 1957, it was billed as the world’s biggest casino hotel outside of Las Vegas. Walking into its lobby today feels like stepping back into the late ’50s. You can almost hear Sinatra singing “Come Fly with Me.” The lobby remains swank and spare and continues to offer stunning water views. As with so much else in Havana, though, the hotel could really use some freshening up — something the Spanish company that now owns it has started to do. A short distance away is the Hotel Nacional de Cuba, whose rooftop deck was the inspiration for the spoils-sharing, cake-cutting scene in “The Godfather II.” (Because of the embargo and toxic relations between the two countries, director Francis Ford Coppola shot his Havana scenes in the Dominican capital Santo Domingo, at locations exquisitely fashioned to resemble the real thing.) Travel review sites groan with complaints about threadbare rugs and tired linens in the Nacional’s current guest rooms. However, its history-packed indoor bar and its must-see outdoor cocktail lounge are both terrific spots to savor a fine Cuban cigar while nursing a mojito or Cuba libre. 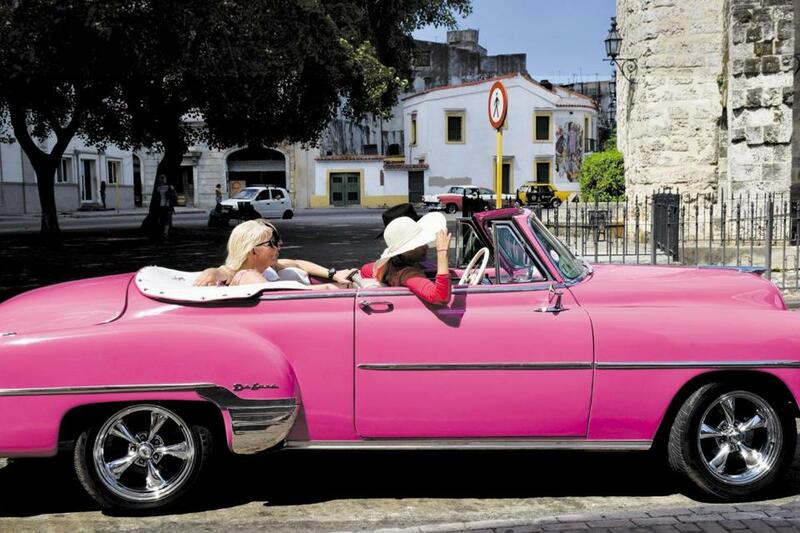 One of the classic cars that populate Havana. The Hotel Capri, where Fredo Corleone delivered a suitcase with $2 million in cash, closed in the early 2000s only to reopen under Spanish ownership a few years ago. In the film, the Corleone family owned the Capri. In real life, it belonged to mobster Santo Trafficante, best known for his suspected involvement in the JFK assassination. Speaking of cash, be sure to pack plenty of it, since US credit cards are of little use in Cuba. In a way, though, that just adds to the vintage/swingers vibe. To build on it, head over to the Tropicana to take in a classic nightclub song-and-dance act. Be warned that you’ll be going more for the scene than any actual entertainment. While the dancers’ acrobatics are impressive, and the costumes with Carmen Miranda-size headpieces are something to behold, the government-owned nightclub is a bit of a tourist trap. The music and dance routines quickly grow repetitive. Tickets are pricey (ranging from $75 to $115), plus a $5 surcharge if you want to bring in your camera. And on the Monday night when I attended, the crowd was dominated by swarms of slow-moving elderly passengers from the cruise ships docked in Havana for the night. Still, it’s quite a scene, especially since it’s all held outdoors, under the stars. There’s certainly no need to stay through the final number and be forced to fight the slow-moving crowd for the exits. When you’ve seen enough of the show, grab a taxi and head back into the city. Beware of bandit taxi drivers, who can often be found driving beat-up Russian Lada sedans. Wait for a licensed cabbie, and agree on the fare ahead of time. If you really want to get around Havana in style, there’s no better way than hiring the driver of a mint 1950s classic American car. They are everywhere around the city, a vestige of Cuba’s pre-Revolution days. The cars tend to be well preserved — locals say that being a mechanic or auto body specialist in Havana usually pays better than being a state-employed physician — although there’s typically not much purity under the hood. Mechanics make do by cobbling together parts from Mitsubishis and Hyundais to keep the old Chevys and Fords running. Cubans refer to this version of a “hybrid” vehicle as a Frankenstein car. Regardless of where the parts may come from, it is a genuine treat to cruise the city in a cherry classic. The car my family and I rode in, owned by a business called NostalgiCar, was an impeccably preserved black Chevy Impala (with a Mercedes engine). Its previous passengers, the driver assured us, included Michelle Obama. Finally, the cigars. They’re so good, and have long been so hard to get in the States, that even many nonsmokers feel compelled to try one when visiting Cuba. 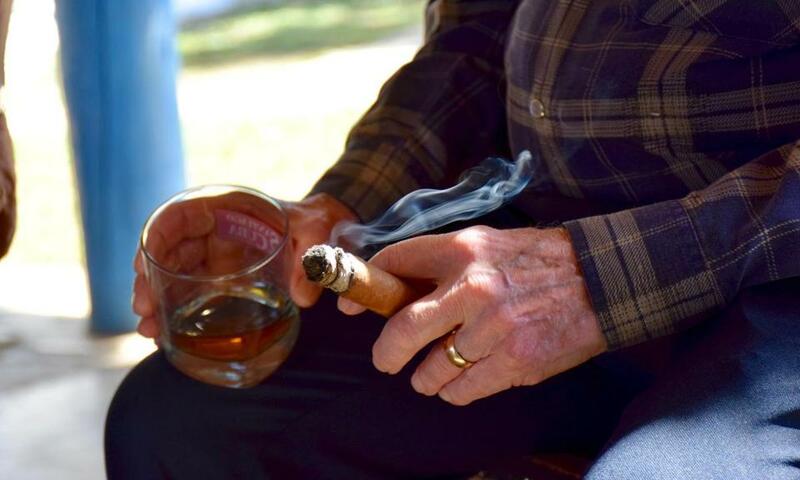 Stopping by a cigar lounge is one way to do it. But if you have time, make the two-hour drive to Hector Luis Prieto’s tobacco farm in the province of Pinar del Rio, where you can see how the tobacco leaves are grown for some of the country’s finest cigars. You can also buy cigars that purport to be every bit as good as the high priced Cohibas, but at a steep discount because they’re off-label. Since this is a working farm with chicken and pigs roaming around you, it also turns out a simple but incredibly fresh lunch of chicken, pork, beans, and rice. The quality and variety of restaurant food in Cuba these days is far higher than it was just a few years ago, thanks to the proliferation of paladares. Instead of state-owned restaurants, these establishments are privately owned. They began as cooks in private homes serving meals to customers, but they now tend to be fully built-out restaurants, many of them quite ambitious. In most places, the offerings differ markedly from what the printed menu promises. That’s because Cuba’s broken economy makes it impossible for chefs to have reliable access to the ingredients they’re looking for, even when they buy from the black market. Still, many manage to turn out adventurous dishes night after night. Some popular paladares have established such devoted followings in the Instagram era that they now regularly attract high-wattage American celebrities. The best example is the buzzy La Guarida, which is tucked into a crumbling section of Central Havana. The food there can be quite good, if inconsistent. The views of the city skyline from its outdoor tables are remarkable. And you just might find yourself dining next to a Kardashian. I’d personally find that last part about as enjoyable as sitting through the sacrilege that is “The Godfather Part III.” But different people define progress differently. Neil Swidey can be reached at swidey@globe.com. Follow him on Twitter @neilswidey.